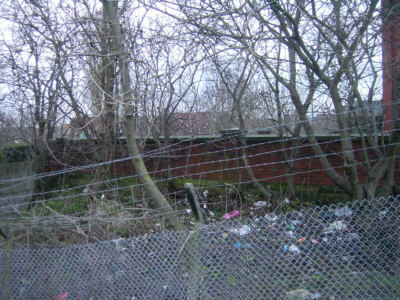 View of the parapet of Manchester Road Bridge, Droylsden, from the north. 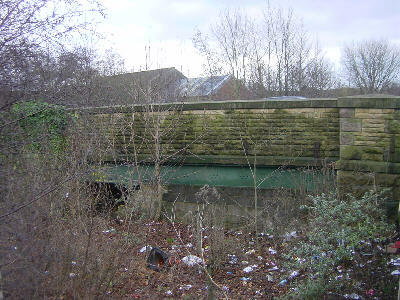 Looking north from Manchester Road Bridge, Droylsden. The infilled line of the canal runs alongside Tesco. 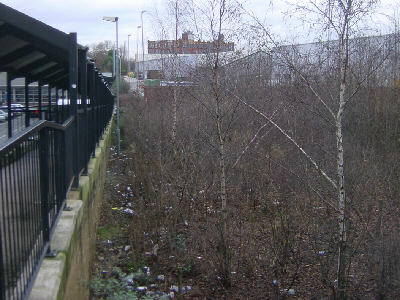 From Manchester Road Bridge, walk eastwards towards Droylsden town centre. Before the traffic lights, turn left and walk through the pedestrian shopping precinct. Continue past the newer shops, heading towards the mill on Greenside Lane. 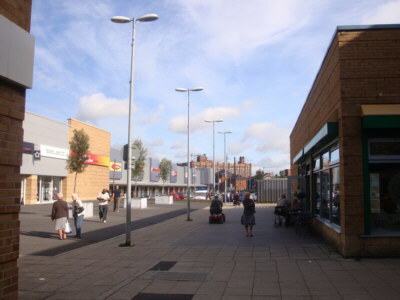 Walk through Droylsden Shopping Centre. The canal line ran behind the shops on the left. 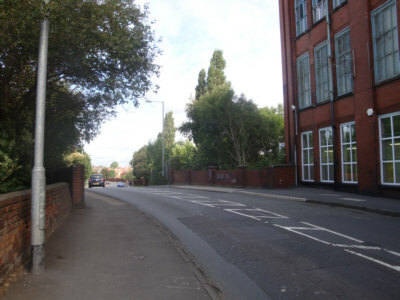 Turn left along Greenside Lane and head towards Harrison's Bridge. The service road behind the shops is partly over the line of the canal. The trees grow where the towpath was. Looking northwards towards the in-filled Harrison's Bridge, with the mill to the right. Harrison's Bridge, alongside Greenside Mill. 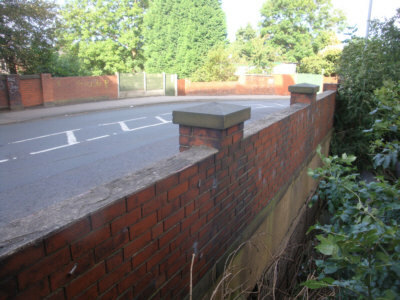 The north parapet of Harrison's Bridge. 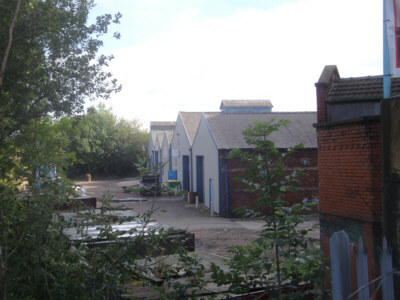 Looking northwards, a factory yard occupies the line of the canal for a short distance. 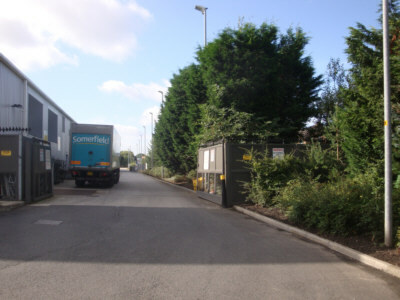 Continue north-westward along Greenside Lane until you reach the mini-roundabout at Five Ways. Turn right along Chappell Road. 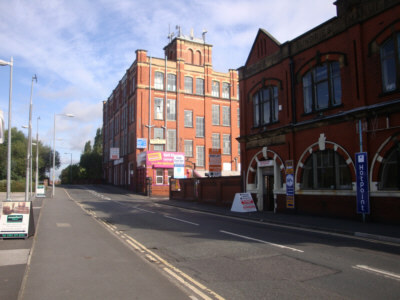 At the far end, turn right along Sunnyside Road towards Medlock Street. The route of the canal crossed the road just after the church, where there are some modern bungalows. Turn left opposite the bungalows and follow the path alongside the club that runs along the line of the canal. Bungalows at St Stephens View, off Sunnyside Road. Looking north from Sunnyside Road. Follow the line of the canal as it passes along a grass strip between the houses of Clough Road and Saxon Drive. 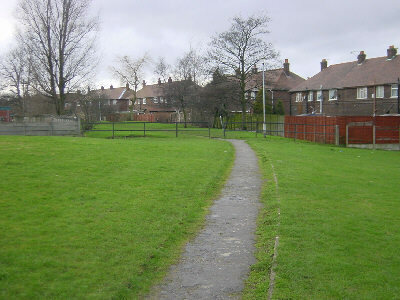 Looking back southwards from the playing field at the end of Clough Road. 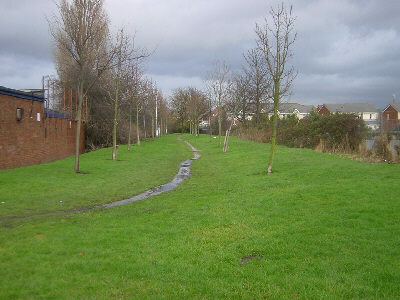 The path curves to the right near the Sports Centre running track, then to the left of a new estate. 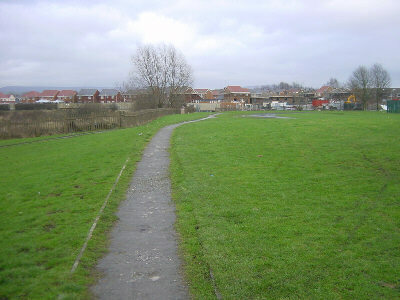 The footpath ahead runs roughly along the line of the former towpath. 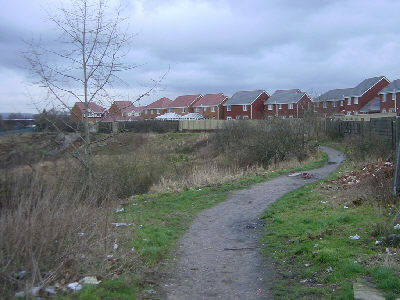 The line of the canal, to the right of the path, has been fenced off to become part of a new housing estate. Some of these houses have been built on or very close to the line of the canal, so a restored canal would need to be built on an embankment to the west of the original line, above Lumb Clough, the dip in the land to the left of the picture. 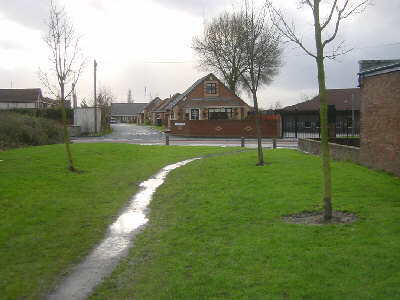 Follow the path to the left of the houses and cross the railway by the footbridge on the site of the former aqueduct. New houses encroach on the canal line. 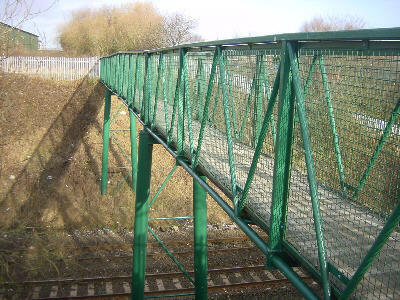 The footbridge replaced the aqueduct across the railway. The footpath along the canal route continues north of the railway. 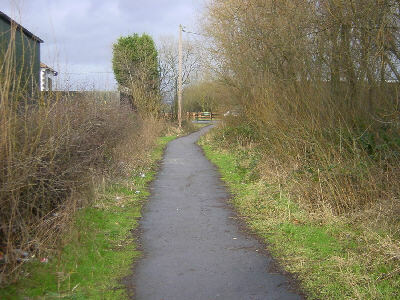 Continue ahead along the footpath that follows the canal line, crossing a road leading to industrial premises at the site of a former swing bridge.